Thanks to the Globe for writing this story and to the Charles River Conservancy and and State Reps Walz and Wolf for their advocacy regarding the inclusion of bike/pedestrian underpasses when the Allston/Cambridge bridges are rebuilt. But it is disappointing a for the state to use as an excuse "the difficulty of securing the federal permits needed to disturb parkland and alter the appearance of bridges in the Charles River Basin". I don't know who would need to approve these permits, but is the point of the permitting process to prevent any change or improvement, locking our surroundings in a time capsule for ever, or it is to allow reasonable and constructive progress? Another significant new development was proposed this week. Apparently the real estate market for these mixed-use urban projects is really picking up. I sure am looking forward to seeing exciting new development come to Barry's Corner and the Holton Street Corridor! Steven Samuels has filed his latest plan to complete the transformation of Boylston Street, behind Fenway Park. The Boston developer, who has won praise from Mayor Thomas M. Menino and the neighborhood for Trilogy and 1330 Boylston, is planning a mix of office, retail, housing and underground parking on a two-acre parcel at 1325 Boylston St. and 132 Brookline Ave. Under the $250 million plan filed today with the Boston Redevelopment Authority, Samuels & Associates has proposed a total of 290 apartments, 195,000 square feet of retail and 225,000 square feet of office space. MIT to redevelop Kendall "as quickly as possible"
I continue to be amazed that while so little new retail is being considered by Harvard in Allston, MIT in Cambridge want to move forward quickly with is major redevelopment of Kendall Square. The proposal heard at the Tuesday informational session, during which board members could speak and ask questions but the public could not, would bring 940,000 square feet of labs and offices, 100,000 of retail and 60,000 for market-rate housing. That’s enough square footage for between 40 and 50 units, associate board member Charles Studen said. The school could get 800,000 new square feet for academic research out of the development. Although the timeline for the project is muddy, the school’s enthusiasm was made very clear by Michael Owu, director of real estate for the MIT Investment Management Co.
“We want to create this space as quickly as possible,” Owu said. What an amazing winter use of vacant space!! 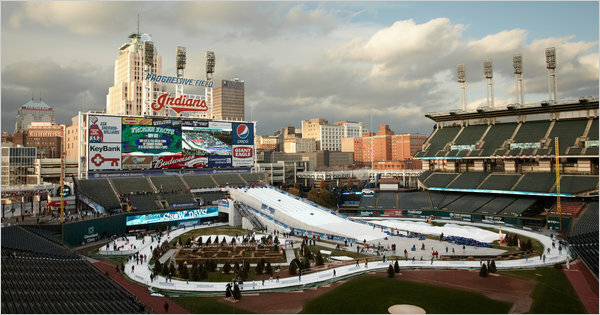 "As part of what the team calls Snow Days, the site’s centerpieces are a 10-lane tubing hill named the batterhorn that stretches from the middle of the bleachers into right field, and a quarter-mile ice skating track called the frozen mile — the first of its kind in the United States, the Indians say — that zips past the warning track, second base, the bullpens and underneath the bleachers. It took about a month to construct the Indians’ winter playground, which was built mostly by local companies, and so far the only real hurdle has been removing the excess snow that has fallen this month. Before nature cooperated, about 120 tons of snow were made daily to keep Snow Days running. The event began the day after Thanksgiving, will run through Jan. 2 and is expected to draw about 60,000 people by the time it closes. Most of the tickets range from $5 to $25. Mayor Menino's PILOT Task Force released its report today with suggested changes to Boston's Payment In Lieu of Taxes program that asks non-profit institutions in Boston to make voluntary payments. Harvard contributes approximately $2M annually and Boston College $300,000, based on property valued at $1.5 billion and $560,000 respectively (5% and 2% of what they would pay if the property was taxable). BU and Berklee top that list by paying 8+% and Northeastern barely "contributes" anything ($30,000 PILOT for $1.3B of property). The Task Force recommends that all non-profits make PILOT contributions of 25% of their property's taxable value, with 50% of this being paid in cash and 50% being in the form of community services. Time will tell how close to this goal the City will get, but it certainly would be a different situation if Harvard contributed 5 times as much as it does now, with this year's $2M cash increasing to $5M cash and accompanied by $5M in service. "Hundreds of Boston elementary school students and teachers participated in a "flash mob" dance on Wednesday to encourage children to read." Quincy model for A/B North? With the BRA talking about a 2-5 year plan for Western Ave, the Holton St Corridor, and the rest of North Allston and North Brighton, the plans for a new Quincy Center are another potential model for the long-promised and long-awaited renaissance in A/B. Quincy's $1.3 billion plan includes more than 1 million square feet of new office space, more than 700 housing units, two hotels, a cinema and entertainment complex, and 570,000 square feet of new retail and restaurant space in Quincy Center with construction scheduled to start in 2013. I can't imagine Harvard and the BRA considering anything of this magnitude being for Allston, but we could put this at one end of the spectrum, MIT's 240,000 sq ft retail/office building at the other end, and then see what relative to those projects Harvard sees itself capable of doing on its many under-used acres. Where is that Harvard Draft IMPNF Hiding? Last week, Harvard distributed a draft Institutional Master Plan Notification Form for the 125 Western Ave project. The PDF was emailed to the members of the BRA's Task Force, city and state elected officials, and staff at the BRA. As I started to think about sharing some thoughts on it, I was looking to see where the document was publicly posted. I looked at Harvard's Allston website and was surprised to see no mention at all of 125 Western Ave and the proposed Tata Hall. Though both of these projects have received extensive Harvard-initiated press coverage in recent weeks, Harvard mentioned neither of them on its Allston website. So I went to the BRA's "Harvard Allston Campus Planning and Institutional Master Plan" website but the most recent document there is meeting minutes from July 2009. This draft became a public document after it was received by the people at the State, City, and BRA who are subject to the Public Records Law but with its limited distribution it is being treated as private. I could cynically guess why there isn't more openness and transparency, but especially because there is talk about re-starting public planning with Harvard and the BRA for North Allston and North Brighton it would be a sign of good faith to see more information-sharing on this project. "And we’ve been looking at the vacant Citgo station on Western and Harvard Ave. in Allston forever, but Harvard has been claiming for 18 months that it is under agreement." Andy O’Brien, Harvard Business School’s chief of operations responded that Harvard feels it needs to have the site ready before it offers a more detailed plan. Does anyone think it makes sense that Harvard needs the building built before it can figure out the details of its public programming? Harvard University won an important ally yesterday in its plans for a $120 million expansion of the Business School. Mayor Thomas M. Menino told the Herald that the city should not stand in the way of the school’s proposal for a new academic facility on Western Avenue. But Paul Alford, who lives near the giant hole that would have been another major Harvard project - the stalled $1 billion science complex on Western Avenue - accused the mayor of a double standard. Myung Dong, 90 Harvard Ave. Request to add Cordials to existing wine and malt license. Notice of Project changes to Griggs Street project (Develop Mt. Vernon Real Estate will describe). Azama Grille, Harvard Ave. Request for extension of hours of operation. Harvard's presentation at Wednesday's Task Force meeting devoted significant time to the concept that Harvard would offer programs and services that would be relevant to business owners and potential business owners in Allston. While Harvard showed us a PowerPoint slide with the logos of many organizations the might be part of this endeavour, there were few (if any) real details provided. One suggestion from the Allston community, that I think has a lot of merit, is that Harvard should more past generalities and develop a business plan for this Harvard Allston Entrepreneurship Portal. The plan would include a staffing plan, budget and funding information, programming plan, outreach plan, and the other details that a Harvard professor would expect from a Harvard Business School student. As it so happens, over the next few months Harvard Business School is running its annual business plan contest. The best and brightest from across Harvard's many schools will be developing plans for new businesses, and the contest even has a Social Venture Track "to educate HBS students in the process of creating and evaluating new ventures that have a central focus on the creation of social value". It is easy to say that 125 Western Ave might be a satellite office for SCORE. It takes some (but not too much) work to contact Harvard alumni to get a rough idea of how many would be willing to serve as volunteer mentors for businesses in Allston. Then it takes a bit more work to figure out how many businesses might be mentored at any one time, how many hours per month of mentoring each business will receive, how businesses will apply to join the program, etc. So here is an opportunity that would benefit both the Harvard students who would develop such a plan and the Allston business owners who would be part of the eventual program. Will Harvard embrace the opportunity and its two-way synergy? Can Harvard match MIT's development? A mile and a half east of Harvard's idle Western Ave foundation, MIT is ramping up plans for a $100 million, 5 story, 240,000 square foot new building. According to The Tech, "the ground floor will be used for retail facilities, while upper stories will be dedicated to research and office space" and construction could start in 2011. The obvious question is if MIT can do something of this magnitude in Cambridge, can Harvard do it in Allston? My understanding is that Tufano's financial expertise was being used to consider financing options for construction on the Western Ave Foundation and elsewhere on Harvard-Allston property. No word on if his position on the Work Team will be filled. Harvard Business School Professor Peter Tufano ’79 will leave Harvard next year to become Dean of the Saïd Business School at Oxford. A $65M gut renovation is underway in Cambridge to create new labs for the stem-cell scientists who were to have come to Allston. As always, the ceramics at this event will be amazing and reasonably priced. If you haven't been in the past, it is definitely worth taking a look. Kudos to our Brighton neighbor Galvin for proposing to get some of the politics out of redistricting. The crazy boundaries that define our State Rep (in green) and State Senate (in purple) show that in neither case do we have districts that are compact, contiguous, and keep communities within a single district. "Stone Hearth applied for a beer and wine license reserved for businesses in “urban renewal areas,” special zones that the Boston Redevelopment Authority designates in need of revitalization. But according to a map on the BRA’s website, the restaurant’s new location on 182 Western Ave. is not included in the nearby urban renewal area encompassing a public housing complex [Charlesview] across the street." By the way, I agree with Harvard's spokesperson that "Stone Hearth is the kind of vibrant, community facing locally-owned business that we’ve consistently heard the community wants." I also stand by my quote in the article that the Harvard-Allston relationship would benefit from more constructive collaboration and I am glad that Stone Hearth will be preparing to open their new restaurant in Allston. But in the letter to the city, officials insisted that new construction on Harvard-owned property should not be considered until significant development of the Holton Street Corridor - an area along Western Avenue that includes the half-vacant Brighton Mills mall - is leased"